For the vegetarian, halal and kosher markets gelatin replacement issue has been around for many years, but has lately procured enlarged interest peculiarly within Europe with the arrival of the bovine spongiform encephalopathy virus. In western parts of Europe, total gelatin usage is around 60,000 tonnes per annum, of which 80% is used by food and beverage industry owing to the textural and rheological properties of gelatin. One potential gelatin alternative for the food industry is gellan gum and new gellan gum products have distinctive properties and tend to lead to a range of functionality in food systems with one versatile hydrocolloid ingredient. Goldstein Research analyst forecast the gelatin market size is set to reach USD 3.75 billion by 2024, at a CAGR of 5.5% over the forecast years. The rising demand for gelatin for cosmetics and personal care applications will drive the growth prospects for the global gelatin market until the end of 2024. The report covers the present ground scenario and the future growth prospects of the Gelatin market for 2016-2024 along with the data of total number of gelatin based products and details of gelatin production plants worldwide. We calculated the market size and revenue share on the basis of revenue generated from major players across the globe. Based on application, food and beverage industry dominated the global gelatin market owing to largest market share of 39.5% in 2016 due to its edible uses and increasing demand of gelatin desserts, gummed candies, marshmallow, wine fining or clarification and prepared meat products. Cosmetic and personal care applications are the fastest growing with the CAGR of 5.65% over the forecast period and tend to be the leading segment in the forecast period due to the use of gelatin as stabilizing, viscosity controlling, and cleansing agent. Gelatin Market Outlook 2016-2024, has been prepared based on an in-depth market analysis from industry experts. 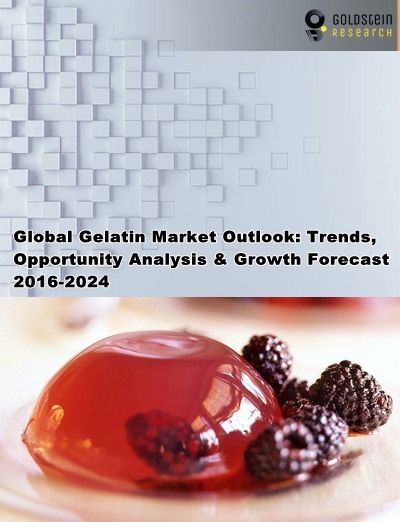 The report covers the competitive landscape and current position of major players in the global Gelatin Market. The report also includes porter’s five force model, SWOT analysis, company profiling, business strategies of market players and their business models. Global Gelatin market report also recognizes value chain analysis to understand the cost differentiation to provide competitive advantage to the existing and new entry players. Our global Gelatin Market report comprises of the following companies as the key players: Weishardt Group, Rousselot, PB Gelatin, Gelita AG, Capsugel, Darling Ingredients Inc., Ewald Gelatine GmbH, Gelnex, India Gelatine & Chemicals, ITALGELATINE, Junca Gelatines, LAPI GELATINE, Norland Products, Qinghai Gelatin, Sterling biotech, and Trobas Gelatine. According to the report, major driving factor is the expansion of gelatin plants in rural areas due to high demand of commercial gelatin products. For instance, Gelita USA Inc. is seeking nearly USD 1.3 million in state and local tax incentives to help fund a USD 22 million expansion of its Port Neal manufacturing complex that would create at least 21 new jobs while Nitta Gelatin India Ltd tends to garner the business due to raw-material availability at more reasonable costs and also the Centre’s recent revision of the regulations relating to crushed bone imports. Further, the report states the major challenge is the recurring protests related to alleging environmental violations and river pollution. For instance, uncertainties at the Kathikudam plant in Thrissur, concerns raised by the Japanese JV partner led the plant to invest 20 crore for environment management systems in the past years, based on the audit conducted by the National Environmental Engineering Research Institute (NEERI) on the Kerala High Court’s directives. Based on geography, Europe dominated the global gelatin market with the market share of 35% in 2016 owing to the presence of dominant manufacturers. The sales of gelatin are likely to increase in Europe with the increasing number of applications in food and beverage products. Increasing demand for frozen foods in emerging markets of Turkey, USA, the UK, Australia, Canada, France, China, India, Saudi Arabia, Germany and Brazil in light of new product launches by food & beverage manufacturers is expected to open new industry avenues over the projected period will consequently fuel gelatin market growth. What is the revenue of Gelatin in 2015-16 and what would be the expected demand over the forecast period?